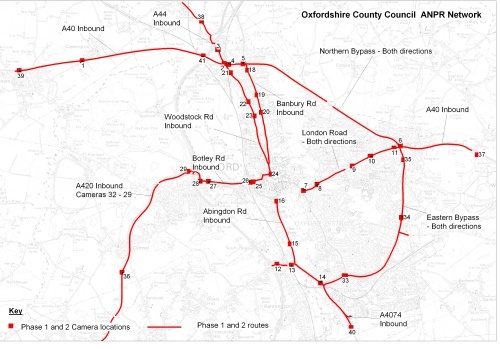 August 2009: Oxfordshire county council is setting up a network of 45 Automatic Number Plate Recognition (ANPR) cameras around Oxford. The system of cameras has been broken down into 3 phases. Phase 1 and 2 (31 cameras) have been completed, phase 3 (14 cameras) has not. 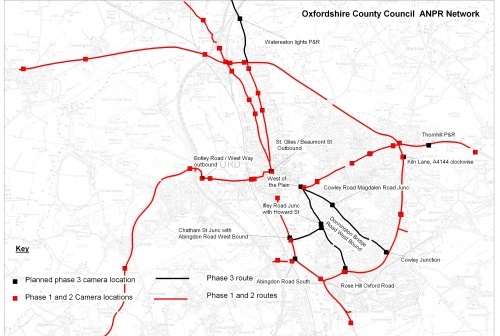 The council claims that the cameras are for traffic management to be used in conjunction with electronic traffic signs to help with congestion but as can be seen from the Oxfordshire Congestion Monitoring report the council already seems to have sufficient information and so the cameras are not necessary. To monitor traffic flow it is only necessary to capture at most three characters from a number plate yet Oxford's cameras take the whole number plate - so these cameras could easily be used in the future for congestion charging or to share information with the police. 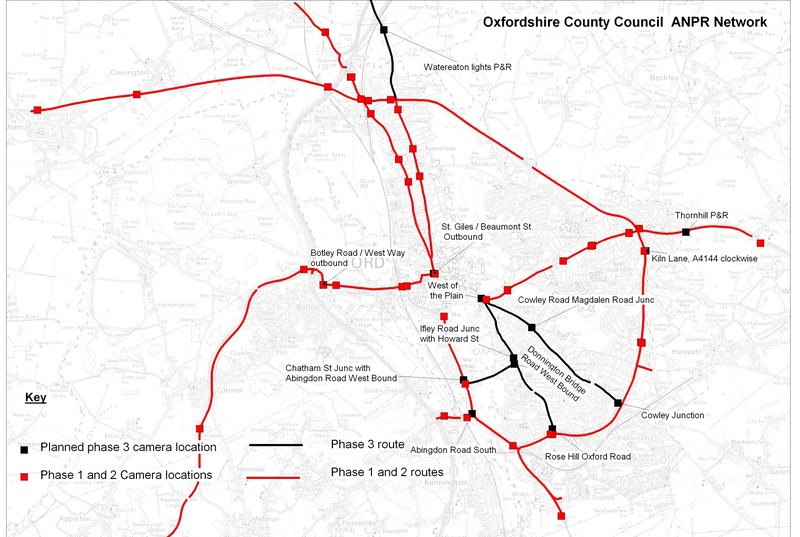 The cost of the ANPR network so far (phase 1 and 2) is just under £0.7m. 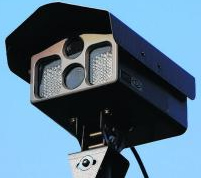 Thames Valley Police operate 47 ANPR cameras but will not release their locations because they say they are concerned criminals would avoid them. 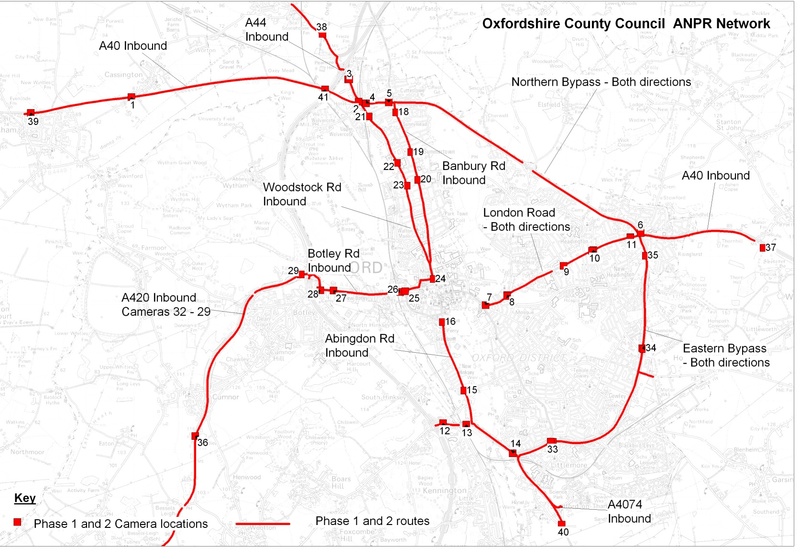 Below are the locations of the ANPR cameras operated by Oxfordshire County Council and its agencies. 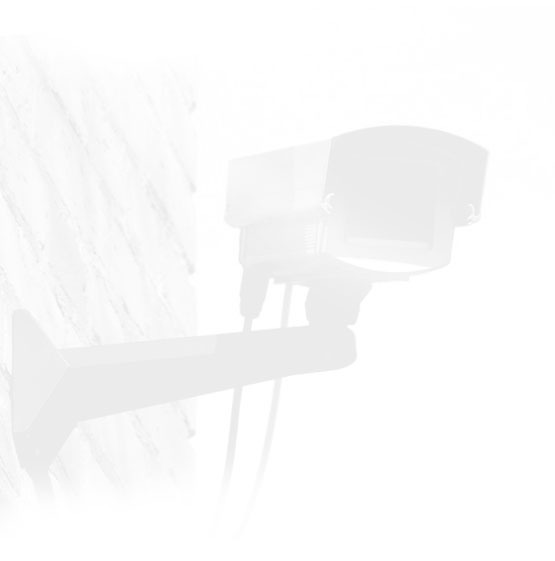 To find out more about ANPR (Automatic Number Plate Recognition) / ANLR (Automatic License Plate Recognition) cameras search for "ANPR" in the search box above.